Please consider making a year-end donation to sustain the Friends of McMillan Park Legal Fund, and join us at the Big Bear Holiday Market on Wednesday, December 20th from 4-9pm. This is our third year at the Big Bear holiday market! With your support, we financed our successful appeal before the D.C. Court of Appeals, as a result of which the Zoning Order and Mayor’s Agent Order were both vacated and remanded. We expect that this case will almost certainly be headed back to court, so we ask for your continued financial support to sustain our legal costs. Friends of McMillan Park is a 501(c)3 educational nonprofit organization and donations to this cause are tax deductible to the full extent of the law. Please also join us to meet, chat, and/or purchase some of lovely McMillan Park holiday cards and Art Photos at the Big Bear Holiday Market this Wednesday, December 20th from 4-9pm. Friends of McMillan Park accepts donations and payment for merchandise in cash, checks payable to the Friends of McMillan Park, via PayPal (the ‘Buy Now’ button on our merchandise page), and via our Crowdrise crowdfunding page. We also now accept donations of financial securities through our new brokerage account (contact Kirby at 202 213-2690 or restoremcmillan@gmail.com for details). Big Bear Café is located at the corner of First Street and R Street, NW. Here is a link to more information about the Holiday Market. McMillan Park History Walking Tour – Sat, 2 Dec 2017, 9am (rain: 3 Dec) – Last Tour of 2017! We are hosting another history walking tour through the Bloomingdale neighborhood and around the perimeter of McMillan Park, led by our neighbor and friend, Paul Cerruti, who has compiled a tremendous amount of detail about the park and its role through the years since it first opened to the public. The event will cover a lot of the information presented in a history walk that we hosted last month in October, which was very well attended and enjoyed! The tour will showcase McMillan Park, its vistas, unique history, and connection to historic landmarks in the Bloomingdale neighborhood. The first part of the walk will include information and bonus highlights about Bloomingdale. The tour will last approximately 1 ½ hours and will start at Big Bear Café (located at the corner of 1st and R Streets NW) on Saturday, December 2nd at 9am (rain date Sunday, December 3rd at 9am). At the conclusion of the tour, we will serve light refreshments and offer a selection of our favorite mounted art photos of McMillan Park for sale. Please register for the Park History Tour by sending an email to restoremcmillan@gmail.com or by calling Kirby at 202-213-2690. We are accepting up to 30 people for this tour to ensure that all who join can hear and fully participate, so we will accept the first 30 registrations. Kindly note, we suggest and greatly appreciate a donation of $20 in advance ($25 on the day of the event) to benefit Friends of McMillan Park’s efforts to save this registered national historic landmark. Even if you are unable to join the tour, please consider making a donation online to help support our efforts. You may provide payment via our PayPal or Crowdrise links available on the web page, www.friendsofmcmillan.org/merchandise, or in person via cash or credit card on the day of the event. The Mayor’s Agent for Historic Preservation and Zoning Commission hearings on the remand of the D.C. Court of Appeals McMillan Park decision have concluded, and no orders formally announcing the position of those two bodies have been issued. When the agency orders are released, we will decide what action to take based on the content of the orders. We expect that the case will almost certainly be headed back to court. We still need your financial support because our legal work is ongoing, and our legal bills continue to accumulate accordingly. DC Water will be present on the site near the corner of 1st & Channing Streets NW for a couple of weeks, conducting the first inspection of the 1st Street stormwater tunnel by lowering equipment down the access shaft located just inside the McMillan Park site. DMPED, DGS, and Gilbane Construction Company announced at a recent ANC meeting that they plan to commence rehabilitation and stabilization work on the silos and regulator houses located in McMillan Park’s two service courts “soon. Some Gilbane equipment is already onsite in the south service court, apparently indicating that this rehabilitation and stabilization work will soon begin. We are hosting another history walking tour through Bloomingdale and around the perimeter of McMillan Park, led by our neighbor and friend, Paul Cerruti, who has compiled a tremendous amount of detailed historical information about the park and its role in our neighborhood through the years since it was first opened to the public. This event will expand upon the successful history walk that we held in October 2016 that was well attended and enjoyed! The tour will last approximately 1 ½ hours and will start at the Big Bear Café (located at the corner of 1st St. and R St. NW) on Saturday, October 28th at 9am (rain date Sunday, October 29th, 9am). At the end of the tour, we will serve light refreshments and offer a selection of our favorite mounted art photos of McMillan Park for sale. This walking tour through Bloomingdale and around McMillan Park is mentioned in the current issue of Home & Design magazine, linked here, and will immediately precede the annual Bloomingdale House Tour that begins at 10:30 am on October 28th (see details of the house tour linked here). The Park History Tour will conclude in time for everyone to participate in the House Tour, and encourage all to do so! Please register for the Park History Tour by sending an email to restoremcmillan@gmail.com or by calling Kirby at 202 213-2690. We are accepting up to 30 people for this tour to ensure that all who join can hear and fully participate, so we will accept the first 30 persons who register. Kindly note, we suggest and greatly appreciate a donation of $20 in advance ($25 on the day of the event) to benefit the Friends of McMillan Park’s efforts to save this registered national historic landmark. Even if you are unable to join the tour, please consider making a donation online to help support these efforts. Payment may be made via PayPal or Crowdrise links on the web page, www.friendsofmcmillan.org/merchandise, or in person with cash or credit card on the day of the event. On July 14, 2017, the DC Mayor’s Agent for Historic Preservation (Mayor’s Agent) held an initial hearing on the remand of the McMillan Park case from the D.C. Court of Appeals. The Mayor’s Agent was unable to conclude the hearing that day, so an additional hearing will occur on Monday, September 11, 2017 starting at 9am at 441 4th St. NW, Room 220 South (same room as Zoning hearings). The July 14th hearing only partially completed cross-examination of the DMPED/VMP witnesses, so the hearing will continue at this point on September 11th. Then Friends of McMillan Park (FOMP) will present its case, there will be cross-examination of FOMP witnesses, and then public organizations and members of the public may testify later in the day (or possibly on the scheduled continuation date of September 18th if the September 11th hearing also runs into overtime). The Mayor’s Agent assured us that he will allow the public to testify on the condition that persons testifying address the specific questions in the Court of Appeals remand. Persons may submit advance written testimony in opposition to or in support of the VMP/DMPED project (FOMP remains in opposition to the project) by 4PM on FRIDAY, SEPTEMBER 8th, via email to julianna.jackson@dc.gov (HPO staff member). Please specify in any submission whether your testimony is in support of or in opposition to the VMP/DMPED project, keep it brief, and identify which of the remand questions you are addressing (see the specific questions the Mayor’s Agent must consider at this hearing here). The DC Zoning Commission has decided to hold another McMillan Park meeting (a “decision meeting”), on Thursday, September 14, 2017 at 7pm (in the usual Zoning hearing room) to “explore more exhaustively whether or not the Commission has considered the proposed height and density of the medical center.” FOMP will attend this Zoning meeting although t is unlikely that there will be any opportunity for the public to speak. This special meeting has been called to ask VMP/DMPED to address certain specific questions about the height and density of the medical buildings proposed for the project. The public is welcome to witness the proceedings in person or via webcast (see the Zoning Commission web page for details). Presumably the Mayor’s Agent and Zoning Commission will write orders at the conclusion of their respective hearings and meetings for presentation to the D.C. Court of Appeals. We are unable to estimate when these written orders will become public since the hearings themselves have yet to conclude. The Washington Post published the following op-ed on January 13, 2017. D.C. Mayor Muriel E. Bowser (D) recently held a “groundbreaking” ceremony for the long-embattled development of the 25-acre parcel of land known as McMillan Park, a historic location in the heart of the District along North Capitol Street that should be an inspiring, world-class public space that would make us proud. But the District’s handling of the development of McMillan Park has been a slow-motion train wreck.One day after the groundbreaking, the D.C. Court of Appeals issued a unanimous decision overturning the District’s zoning and historic preservation approvals for the project at the old McMillan sand filtration site. The court’s resounding rejection of the agency approvals sends the entire process back to D.C. officials to reconsider how to proceed with the project. The court’s decision vindicates the arguments of the community that the approvals “failed to adequately explain why it was necessary to disregard” certain key policies in the Comprehensive Plan, which should “guide executive and legislative decisions.” The court also found that agency approvals failed to comply with D.C.’s historic preservation law, which prohibits harming landmark sites such as McMillan except under very limited circumstances. There was essentially no competition on the project, as pointed out by the D.C. auditor in an October 2015 letter to the D.C. Council chairman warning that the entire project should be rebid. In response, the chairman authored an “emergency” bill in April 2016, retroactively waiving the requirement for bidding out this project. The District has signed an exclusive rights agreement with its selected development team, precluding competition for any aspect of the project. Residents were presented with a single, high-density “spec” development project whose impacts are grossly disproportionate to its public benefits. The location of this high-density development, about a mile from the nearest Metro station, in an area that already suffers from severe traffic congestion, is asking for trouble. The court decision correctly criticized the District’s failure to undertake any consideration of alternative designs that could achieve the same public benefits — a park, a grocery and affordable housing — while reducing the level of harm to this iconic site. The McMillan site is assessed by the city to be worth approximately $100 million, as is. Nevertheless, the District has agreed to pay all the predevelopment costs for the project, estimated to be approximately another $100 million, thereby assuming the developers’ risk, so that the developers can build for an undisclosed rate of return almost a million square feet of commercial space that no one wants or needs. And here is the real kicker: The council has agreed to sell this land — assessed at $100 million plus the additional $100 million taxpayer-funded upgrade — back to the developers for only $17 million. What a bargain. Demand a clear and binding accounting from the winning bidder to clearly establish the benefits to the District and taxpayers of the project. Bowser has a huge opportunity here to undo years of misguided and secretive backroom dealings and irresponsible spending that she inherited from her predecessors. She should let the sunshine in and ensure that the site is developed in a manner consistent with the unique character of the District, our history and the law. The writer is treasurer of Friends of McMillan Park. The Post’s View: What next for the McMillan plant? 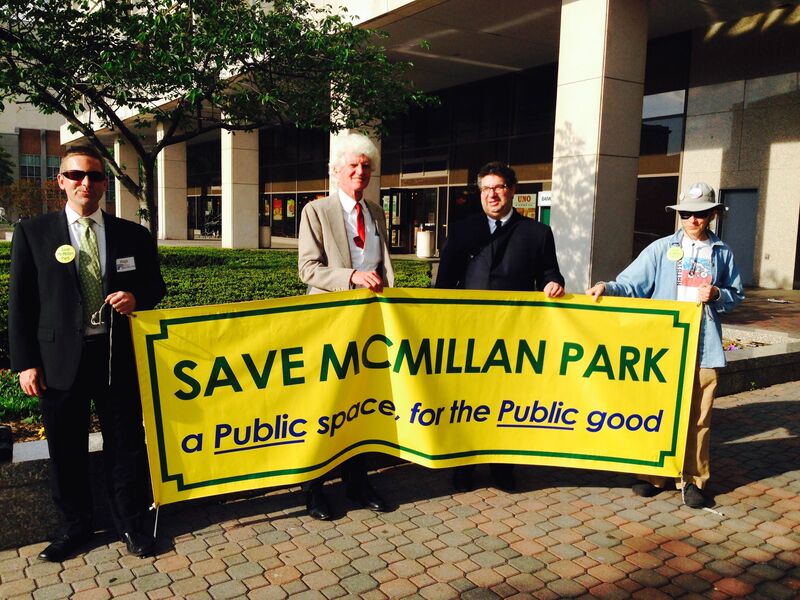 What is the Save McMillan Park Lawsuit All About? Friends of McMillan Park and other historic preservation organizations have joined in filing a legal appeal of the District of Columbia Government’s zoning and preservation decisions that would allow for demolition of 80 to 90% of the historic, below-grade vaults and numerous other historic features combined with high-density commercial development on the 25-acre, DC-owned portion of historic landmark McMillan Park. The appeals also challenge the proposal to subdivide the historic site into several parcels for sale to commercial high-rise developers who aspire to turn McMillan Park into a suburban office park reminiscent of Tysons Corner. The Friends organization has been working with legal counsel since 2014 before the case went before the DC Historic Preservation Review Board, the Mayor’s Agent for Historic Preservation, and the Zoning Commission under the assumption that these District government agencies would approve this commercial development proposal that has plagued our community since at least the Fenty Administration. That assumption proved true. 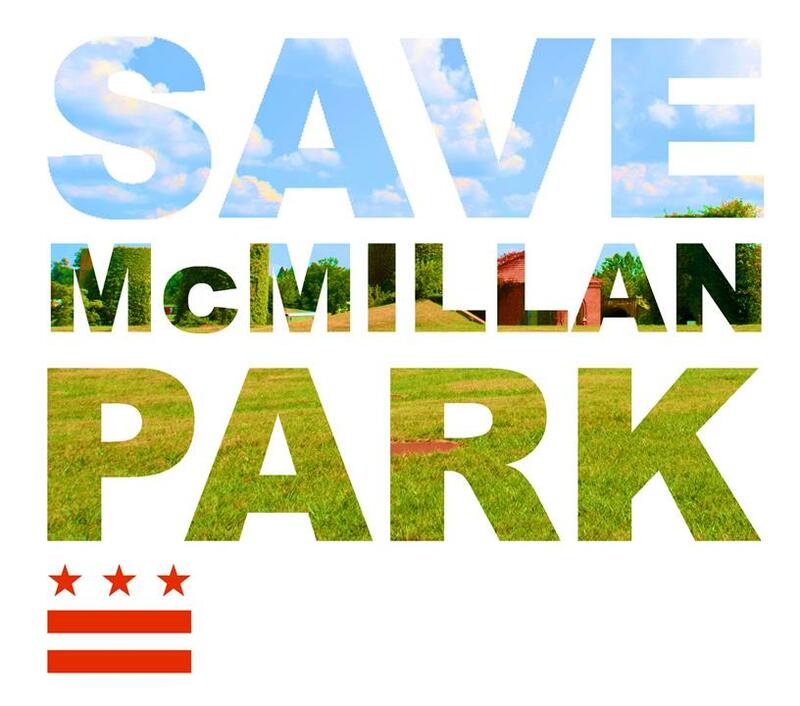 After the Mayor’s Agent and Zoning Commission decisions for McMillan became public in April 2015, we immediately began the appeal process by filing petitions for review with the DC Court of Appeals. The court accepted our preservation and zoning appeals and consolidated them into one case. We filed our opening brief for the case this past week. We currently have no date for the first appearance in court on this matter although we expect that it may be some months away. High-density zoning for McMillan Park is inconsistent with the DC Comprehensive Plan and the Future Land Use Map recommendations of low-to-moderate density zoning. Because McMillan Park has been a DC Historic Landmark since 1991 (and also is listed in the National Register of Historic Places), demolition of a significant portion of the site’s protected historic resources is inconsistent with the protections afforded by the DC Historic Landmark and Historic District Protection Act. The Mayor’s Agent decision to permit demolition and subdivision of this DC Historic Landmark did not consider alternatives that could achieve the “special merit” objectives of the proposal, as required by the Preservation Act. The proposed development project does not satisfy the “high standard” required of a project of “special merit” (required in order to waive the statutory preservation restrictions) because the majority of the development proposal, such as the commercial medical office buildings has no demonstrated special merit. 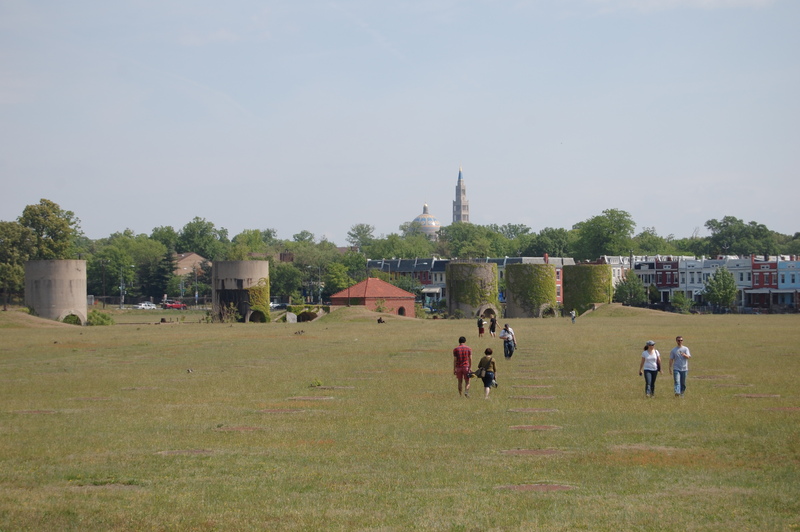 McMillan Sand Filtration Site is a unique and irreplaceable landmark that should be developed in a manner consistent with the site’s historic character and within existing zoning guidelines. The project should also align with the concerns and wishes of the surrounding community expressed consistently for decades (http://bit.ly/24AgxuX). As such, McMillan Park needs a competitive, open bidding process or a Request for Proposals (RFP) solicitation like the District government used for the St. Elizabeth’s, Walter Reed, and Franklin School redevelopment projects. The McMillan Park redevelopment deal before us today devolved long ago into the current no-bid, sole-source plan that violates DC Government procurement law. McMillan Park deserves an open design competition like the one used for The High Line redevelopment project in New York City.